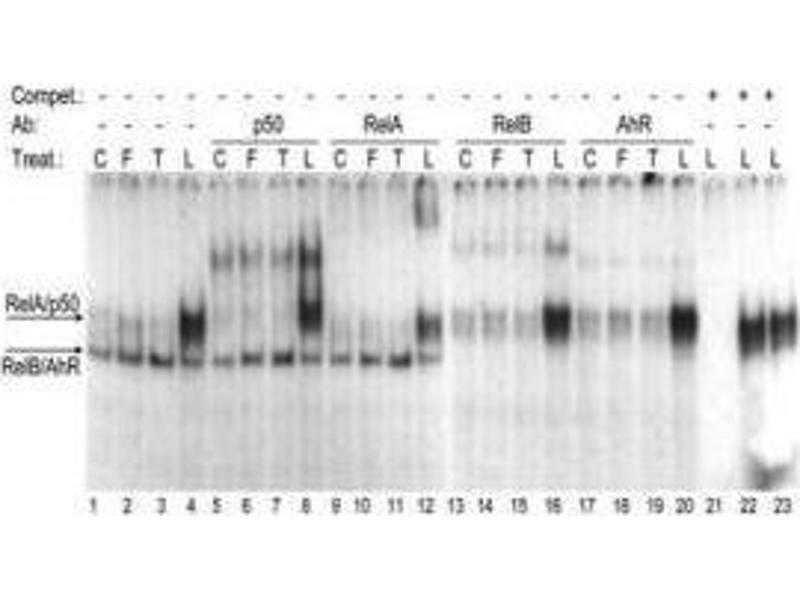 Gel Super Shift Assays: AHR Antibody [ABIN249964] - EMSA validation of AHR antibody on U937 cells nuclear protein. 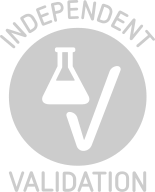 Image submitted by verified customer - see review for protocol details. Immunocytochemistry/Immunofluorescence: AHR Antibody [ABIN249964] - HeLa cells were fixed for 10 minutes using 10% formalin and then permeabilized for 5 minutes using 1X TBS + 0.5% Triton-X100. The cells were incubated with anti AHR [ABIN249964] at a 1:100 dilution overnight at 4C and detected with an anti-goat Dylight 488 (Green) at a 1:500 dilution. Actin was detected with Phalloidin 568 (Red) at a 1:200 dilution. Nuclei were counterstained with DAPI (Blue). Cells were imaged using a 40X objective. 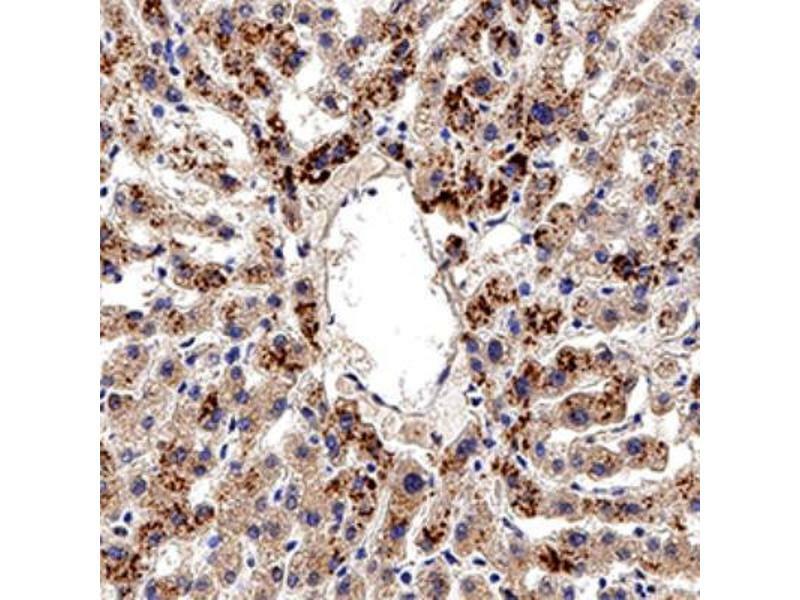 Immunohistochemistry-Paraffin: AHR Antibody - IHC analysis of formalin fixed paraffin-embedded (FFPE) human liver using 20 ug/ml conc. 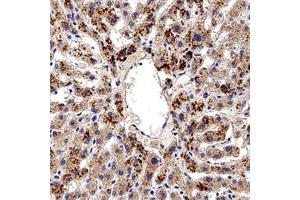 of AHR antibody on a Bond Rx autostainer (Leica Biosystems). The assay involved 20 minutes of heat induced antigen retrieval (HIER) using 10mM sodium citrate buffer (pH 6.0) and endogenous peroxidase quenching with peroxide block. The sections were incubated with primary antibody for 30 minutes and Bond Polymer Refine Detection (Leica Biosystems) with DAB was used for signal development followed by counterstaining with hematoxylin. Whole slide scanning and capturing of representative images was performed using Aperio AT2 (Leica Biosystems). Staining was performed by Histowiz. 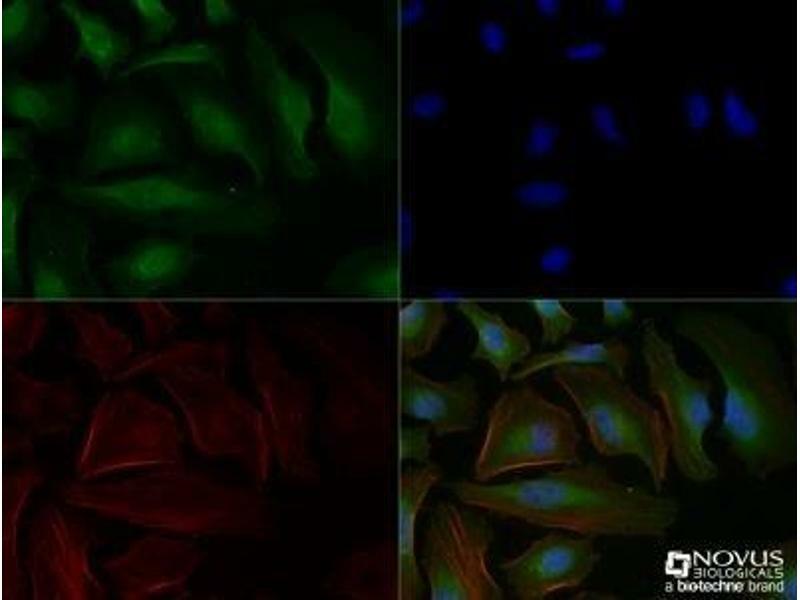 Application Notes Chromatin Immunoprecipitation, Immunohistochemistry, Immunocytochemistry/Immunofluorescence 5-20 μg/mL, Gel Super Shift AssaysSuggested working dilution for Gel Super Shift Assay (EMSA) is 4 μL of antibody to a 15 μL final volume of EMSA sample. 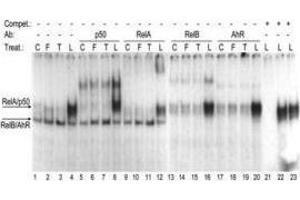 The current lot of this antibody did not work in WB to our QC Team's expectations. Storage Comment Aliquot and store at -20°C or -80°C. Avoid freeze-thaw cycles. Fukuda, Nishiumi, Yabushita, Mukai, Kodoi, Hashizume, Mizuno, Hatanaka, Ashida: "A new southwestern chemistry-based ELISA for detection of aryl hydrocarbon receptor transformation: application to the screening of its receptor agonists and antagonists." in: Journal of immunological methods, Vol. 287, Issue 1-2, pp. 187-201, 2004 (PubMed). (Sample species: Human). Minsavage, Vorojeikina, Gasiewicz: "Mutational analysis of the mouse aryl hydrocarbon receptor tyrosine residues necessary for recognition of dioxin response elements." in: Archives of biochemistry and biophysics, Vol. 412, Issue 1, pp. 95-105, 2003 (PubMed). Hayashibara, Yamada, Mori, Harasawa, Sugahara, Miyanishi, Kamihira, Tomonaga: "Possible involvement of aryl hydrocarbon receptor (AhR) in adult T-cell leukemia (ATL) leukemogenesis: constitutive activation of AhR in ATL." in: Biochemical and biophysical research communications, Vol. 300, Issue 1, pp. 128-34, 2002 (PubMed). Chan, Chu, Jain, Reddy, Bradfield: "Baculovirus expression of the Ah receptor and Ah receptor nuclear translocater. Evidence for additional dioxin responsive element-binding species and factors required for signaling." in: The Journal of biological chemistry, Vol. 269, Issue 42, pp. 26464-71, 1994 (PubMed). Poland, Glover, Bradfield: "Characterization of polyclonal antibodies to the Ah receptor prepared by immunization with a synthetic peptide hapten." in: Molecular pharmacology, Vol. 39, Issue 1, pp. 20-6, 1991 (PubMed).